So my second entry to Platinum Chef Challenge, Round 5 is a simple chicken salad with an avocado spread. The ingredients for this challenge are basil, avocado, grapes, black beans, and rice. I already posted my Black Bean and Rice "Burgers", which used three of the ingredients and left me with grapes and basil as a requirement in this dish. To make spread, combine avocado, mayo, lemon juice, and basil in a food processor, blend until smooth. Add to chicken and grapes and mix until combined. (The amount of spread made by this recipe was the perfect amount for me to combine the chicken and grapes). Sandwich between bread or in a wrap, and enjoy! So I missed a few of the last challenges. Wedding planning had me pretty busy, and creatively, I was tapped out. This round certainly looked like something I could handle, and I was ready to get back in the swing of being creative in the kitchen. So, grapes, avocado, basil, black beans, and rice, here we go! Today, I present my first entry: Black Bean and Rice "Burgers"
Mash the beans with a potato masher or instrument of your choice (I used an immersion blender, which purees most of it and leaves some chunks). Add remaining ingredients except cheese and avocado. Mix with hands or spoon, just until blended. Score with hand or spoon to mark off 4 even portions. Divide one portion in half, making two thin patties. Place a thin slice (or slices, depending on the shape of your cheese) over one patty, then top with the other. Press around the edges to join the two patties (and hopefully keep the cheese IN the burger and not all over the grill :-) ). Repeat with 3 remaining portions to make 4 burgers. Grill over 'medium' heat (our grill doesn't have a numeric temperature gauge) for 5 or so minutes per side, until browned and cheese is melted (and possibly oozing out the sides). Heat vegetable oil in saucepan. Add onion, over low-medium heat, 1-2 minutes or until lightly browned. Add rice, stirring occasionally for 3-4 minutes until rice is browned. Add water (watch out, it will sizzle!) and bouillion, bring to a boil. Cover and reduce heat to a simmer, until water is absorbed and rice is cooked, about 30 minutes. This makes just over 1 cup of rice. Pre-heat oven to 350 degrees. Beat egg. Add sugar, butter, applesauce, bananas, and pineapple, beat on medium until well-blended. Sift together flour, baking sode, salt, cinnamon, and nutmeg, then slowly add to the banana mixture. Beat on low until well-blended, but be sure not to overbeat. Grease and flour (or use Pam for Baking spray, or parchement paper) a loaf pan and pour in mixture. The original recipe calls for baking 50-60 minutes. I divided this batter into 4 mini loaf pans, so I watched them and checked with toothpicks until done, which was about 40 minutes. Pre-heat oven to 350 degrees. Beat egg. Add sugar, butter, applesauce, bananas, and pineapple, beat on medium until well-blended. Sift together flour, baking sode, salt, cinnamon, and nutmeg, then slowly add to the banana mixture. Beat on low until well-blended, but be sure not to overbeat. Add nuts and mix until evenly distributed. Grease and flour (or use Pam for Baking spray, or parchement paper) a loaf pan and pour in mixture. The original recipe calls for baking 50-60 minutes. I divided this batter into 4 mini loaf pans, so I watched them and check with toothpicks until done, which was about 40 minutes. They aren't terribly "pineapple-y", but very moist! The pineapple acts to balance out the banana flavor a bit, without imparting too much distinct pineapple flavor. With her help, we've figured out what's "good" and my shopping stays pretty limited to those items. One of her recommendations is fresh ramen noodles. I don't really like it as a soup, so I've worked with it a little each time I make it, and finally have come to something I like. Inside the package is three individual servings of noodles, with three soup base packets. Heat a little vegetable oil and garlic in a pan. Add the veggies and season with onion powder and chili powder, to your taste. Towards the end, I toss in some sesame seeds. Stir fry until the are cooked to your preferred level of 'done-ness'. Remove from the pan when done. Heat some more vegetable oil and garlic in the same pan. Add the chicken and season with onion powder, chili powder, salt and pepper. Again, when nearly done, I add sesame seeds. 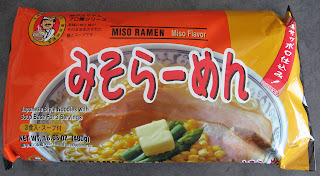 I cooked the ramen according to the package directions (in English! ), which is 1 1/2 minutes in boiling water. The soup base calls for mixing with 1 1/4 cups boiling water, but I think that is just for one serving. I was making all three, but since I wanted more of a sauce than a soup, I added about 2 cups of water to the 3 combined packets of soup base.